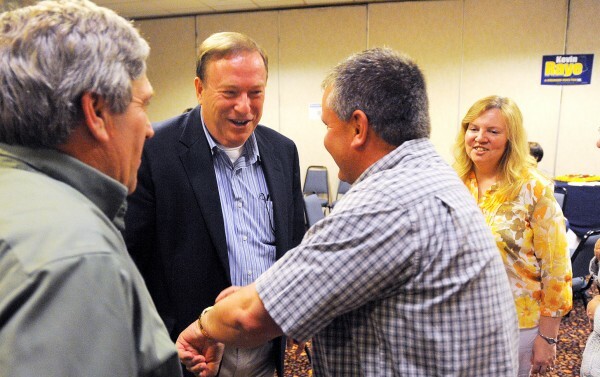 Maine 2nd District Republican candidate Kevin Raye is greeted by supporters at his primary election watch party at the Ramada Inn in Bangor on Tuesday, June 12, 2012. Maine 2nd District Republican candidate Kevin Raye (second from left) and his wife, Karen Raye (right), are greeted by supporters at his primary election watch party a the Ramada Inn in Bangor on Tuesday, June 12, 2012. 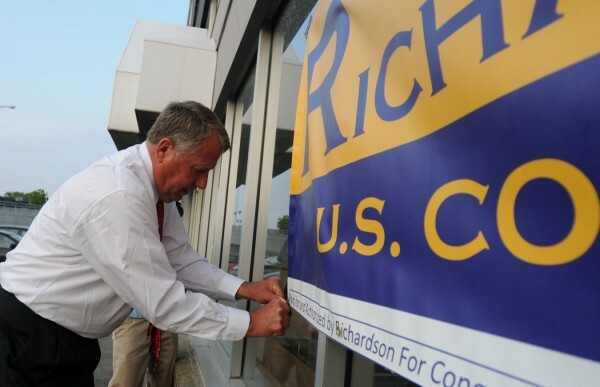 2nd District congressional candidate Blaine Richardson tapes a banner on a store front next to Hero's sports bar in Bangor before attending his primary night party there Tuesday evening, June 12, 2012. 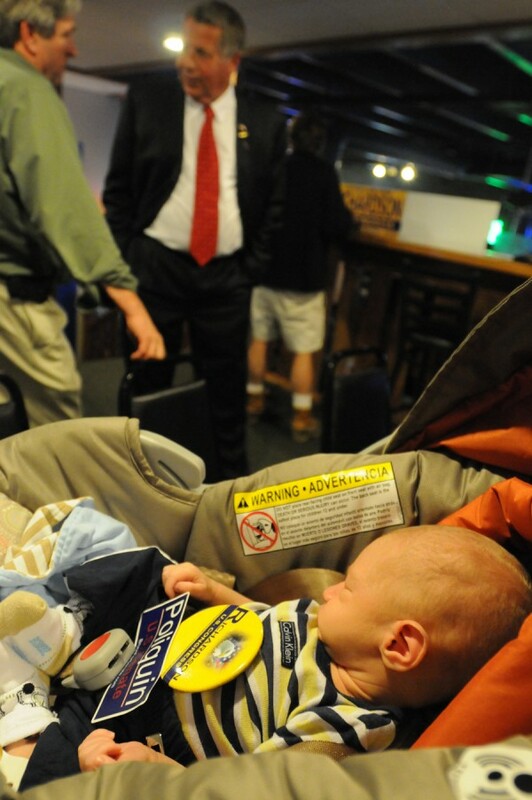 2nd District Republican candidate Blaine Richardson (center) talks with supporters while 3-week-old Max Prill of Winterport sleeps while holding a Richardson pin at Richardson's campaign party at Hero's sports bar in Bangor Tuesday evening, June 12, 2012. BANGOR, Maine — The fight to represent the largest congressional district east of the Mississippi River will be a rematch. As of 1 a.m. Wednesday, Maine Senate President Kevin Raye held a wide lead over Blaine Richardson of Belfast, 16,049 votes to 10,453, for the Republican nomination in the 2nd Congressional District, according to unofficial totals compiled by the Bangor Daily News. Raye will face incumbent Democratic Rep. Mike Michaud of East Millinocket in the November election. 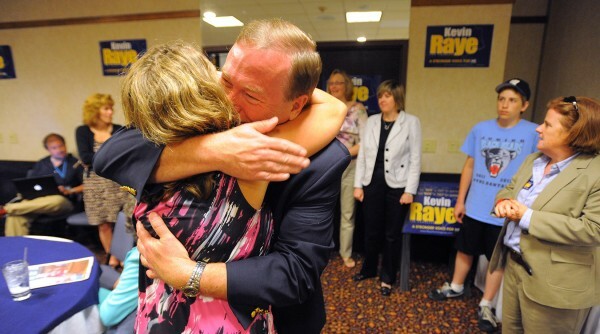 “I feel very good about where we are at and where we are starting from,” Raye said Tuesday night from his campaign celebration at Bangor’s Ramada Inn. When Michaud and Raye faced each other in 2002, Michaud, then Maine Senate president pro tempore, got 52.6 percent of the vote to 47.4 percent for Raye. Raye said he looks forward to the rematch. A four-term state senator from Perry unanimously elected to be Senate president in 2010, Raye was the favorite in the GOP primary against Richardson, a political neophyte but a retired U.S. Navy captain who served for more than 30 years. Richardson said he was proud of his campaign. Maine election officials had predicted a low voter turnout, noting the small number of requests for absentee ballots. They predicted that the numbers would fall far short of those in the June 2010 primary, when 36,946 absentee ballots were cast, and the June 2008 primary, with 14,430 cast. Primary elections typically have low turnouts, in the 20 percent range. Raye, who co-owns Raye’s Mustard Mill in Eastport with his wife, Karen, is a former chief of staff to U.S. Sen. Olympia Snowe. He first was elected in Senate District 29, which includes Washington County and parts of Hancock and Penobscot counties, in 2004. A Navy veteran and building contractor, Richardson was a Liberty Party-endorsed candidate who said he decided to run after the National Defense Authorization Act was signed into law late last year. The Belfast resident condemned the act for what he said was its authorizing the president to order the military to indefinitely imprison people captured anywhere in the world. Richardson said he hoped that his candidacy showed Raye how people want candidates who stand for fundamental American values ― people farther to the right than Raye is. Richardson’s platform reflected a fundamental stand against governmental overreach. He favored term limits, a balanced budget amendment, and a repeal of the Affordable Care Act and of about 82,000 pages worth of regulations he said the Obama administration has enacted since 2009, he said. Raye said he doesn’t expect the Richardson campaign to change his stances on issues. The 2nd Congressional District is much more Republican now than it was in 2002, he said, with healthy GOP majorities in both chambers of the Legislature. Raye didn’t wait for the primary to start engaging Michaud on issues. When the candidates’ pre-primary fundraising reports came due, Raye’s campaign was quick to point out that much of Michaud’s money came from a host of nonparty or political action committees, unions, associations and corporations. Michaud’s campaign responded that the election would be about people, not campaign contributions, and said that Raye was just disappointed at not having raised more money. Raye said he was pleased with his strong showing in Lewiston and Washington County and touched that Republicans in Perry, his hometown, had voted for him 74-0. “I didn’t know you could get numbers like that,” Raye said. Aside from a radio show appearance on Wednesday, Raye said he plans to do no campaigning for a day or so. He guessed that over the last two weeks, he has spent only about 30 hours at home ― too little when co-managing a small business.